Celebrate the New Life Festival with the Altmer of Haven. Breda, a New Life Herald in Eastmarch, spoke of Haven's New Life Festival in Grahtwood. Talk to Ormurrel at the Temple of the Eight in Grahtwood. Speak to Ormurrel again to donate gold to the war orphan fund. Kill five encroaching creatures to clear the path. (Optional) Complete the other objective. This quest can be obtained once a day by talking to Breda, south of Windhelm. She will give you one of 9 quests; you can abandon a quest and get a new one from her to get a different one. "The High Elves of Haven have the War Orphan's Sojourn. They travel to a temple in the heart of Grahtwood and donate what they can. I'll mark your map. It's quite simple—give what you are able to give." All right, I'll walk the War Orphan's Sojourn. "Another on the War Orphan's Sojourn? Though Stendarr provides for all lost children, we will not turn away donations for our charges." Other than donations, what can I do to help? "Ah, yes. Some of those who walk the War Orphan's Sojourn are far less capable than yourself. The creatures alerted to their passage see them as a fine meal. Aggressively dissuading these creatures would help clear the path. If you're so inclined." How do I donate to the war orphan fund? "I can assist you with that. Anything you can donate will help. We must keep our charges fed." "What grace. Stendarr smiles upon those who help lost children. Today, he smiles upon you." I completed the War Orphan's Sojourn. I did all I could to help the children. "Then you truly understand the War Orphan's Sojourn. The children have lost everything. Providing what you can, and then even more, gives them New Life in a new year. It is not easy. But it eases their burden, which is all they know." 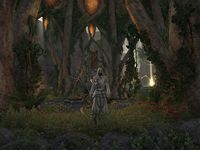 The quest provides a circle in which to kill the encroaching creatures, but you may receive credit for killing creatures almost anywhere in Grahtwood. The creatures within the circle do respawn more quickly during the Festival, however, and not all creatures outside will count. In particular, Daedra, undead, and humanoid enemies never count, but even among the more natural creatures, it seems fairly arbitrary which ones do and do not count when you are not within the quest circle. In order to get the achievement War Orphan's Benefactor, it is not necessary to complete both objectives in one playthrough of the quest - they can be completed in separate playthroughs. New Life Celebrant 10 Complete all New Life Festival celebrations across Tamriel. Glory of Magnus 50 Complete each of the achievements associated with the New Life Festival. To complete the War Orphan's Sojourn, I must first travel to the Temple of the Eight in Grahtwood and speak with Ormurrel. To complete the War Orphan's Sojourn, I must either donate gold to the Temple of the Eight in Grahtwood or kill encroaching wildlife that threatens the temple. If I wanted to help more, I could also kill encroaching wildlife that threatens the Temple of the Eight in Grahtwood. (Appears if you killed wildlife first.) If I wanted to help more, I could donate gold to the Temple of the Eight in Grahtwood. This page was last modified on 20 December 2018, at 04:23.